Vincent 's gift was that he was able t to use his influence among the rich and fashionable to organise the resources needed for works of charity among the poor and oppressed. 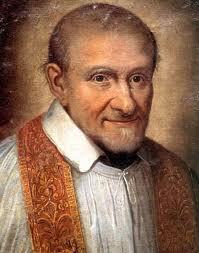 Summary of St Vincent de Paul, Priest. Born in Gascony (France) in 1581; died in Paris on this day in 1660. A parish priest who worked for the apostolic renewal of the clergy, founding the Congregation of the Mission (Vincentians or Lazarists) for missionary work in rural areas and for the formation of clergy. Committed above all to the oppressed and disadvantaged, he founded the Daughters of Charity with Louise de Marillac to work with the needy. During the French Revolution, when rioting mobs broke into the Pantheon in Paris, they smashed all the religious statues but one – that of St Vincent de Paul. He had spoken so movingly about the preciousness of the ordinary person and his image of kindness to the poor was so strong that they could not bring themselves to throw him out with the rest. Founder of the Congregation of the Mission (Vincentian Fathers) and of the Daughters of Charity, he remains today an icon of charity. Patrick Duffy tells his story. A peasant by birth, Vincent later came to associate with both the upper and the lower classes of society. Educated by the Franciscans at Dax in the south-west of France, he was ordained when he was only nineteen and four years later (1604) graduated in theology from the University of Toulouse. The story that he was captured by pirates and escaped may be apocryphal. He may have gone to Rome and for some years led the life of an ambitious court chaplain. 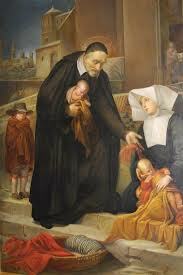 But around 1608, influenced by the spiritual guidance of Pierre de Berulle, he had a conversion experience. De Berulle had him made parish priest at Clichy near Paris. The following year he became tutor to the children of the de Gondi family, who were Florentine bankers introduced to France by Catherine de Medici. He began giving missions to the peasant workers on the Gondi estates. For a while – to distance himself somewhat from the Gondis – he went as parish priest to Chatillon-les-Dombes near Lyons, where he converted several Protestants to Catholicism and founded the first conference of charity for the assistance of the poor. Recalled by the de Gondi in 1617, he resumed his missions for the peasant workers. Several Paris priests joined in this. After each mission, a conference of charity was founded for the relief of the poor, in many places like Joigny, Châlons and Mâcon, where they lasted until the Revolution. From this time, Vincent recruited some “Ladies of Charity” to help in the care of the poor. Many of these ladies were not able, or felt it was beneath them, to carry out some of the more repulsive tasks. So Vincent recruited young humble country women with the energy and attitude to deal with people weighed down by destitution and providentially a friend, to whom he was a spiritual guide, Louise de Marillac, undertook to train them. This was the start of the Daughters of Charity (1633). Vincent also directed his concern towards the convicts in the galleys. M. de Gondi was general of the galleys of France so Vincent was able to gain access to the prisons where they were kept before they were convoyed to the galleys. Vincent performed caring services and spoke with kindness to them and tried to relieve their atrocious conditions. In this way he won their hearts. He also interested others to come and visit them. He bought a house in which he set up a hospital. In 1619 Louis XIII appointed him royal almoner of the galleys, and Vincent used this title to visit the galleys of Marseilles and Bourdeaux where he preached successful missions. Around 1625, Vincent saw that the success achieved by the missions in rural areas could not last unless there were priests to maintain it. Encouraged by Mme de Gondi, he decided to found a religious institute of priests who would devote their energies to the evangelisation of country people – the Congregation of the Mission. 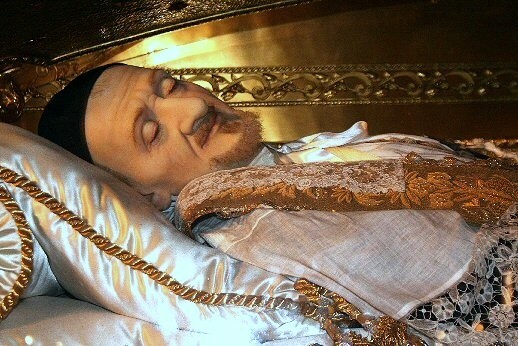 The Congregation acquired a location in the Collège des Bons Enfants in Paris and, with St Vincent de Paul at its head, was recognised by Rome in 1632. 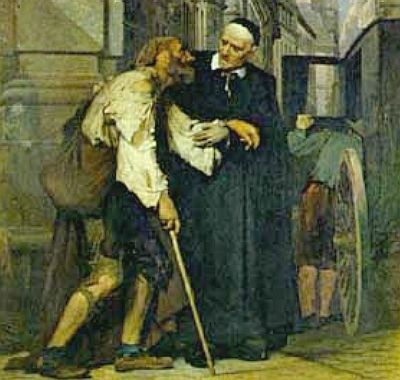 At that same time Vincent acquired the priory of St Lazarus (formerly a refuge for lepers) in Paris, whence the name Lazarite or Lazarist Fathers, by which they were then first known. But priests were very few and there was a huge need for training. This need led to another Vincentian initiative. The Council of Trent (1545-63) had ordered the setting up of seminaries for the education of the clergy but the wars of religion had hindered the initiatives taken. Every Tuesday at Saint-Lazare Vincent began giving spiritual conferences for priests. Soon the Bishop of Beauvais asked him to give ascetical conferences for priests lasting ten days These gradually became extended in time until eventually, with Vincent spearheading the movement, a whole range of seminaries was established all over France, staffed mainly by priests of the Congregation of the Mission. Vincent died in 1660. The missions and conferences he conducted and the seminaries he set up instilled a new Christian spirit and confidence into French priests and lay people. Ever the practical man, his gift was that he was able throughout his life to use his influence among the rich and fashionable to organise the resources needed for works of charity among the poor and oppressed.